Could light one day be used to restore hearing? To try to answer that question, a team of German bioengineers surgically installed coiled strips of optical fibers in the ears of deaf gerbils. Researchers are beginning to demonstrate that light, not electricity, may be the best way to convey the rich information contained in sound. While they still had their hearing, the gerbils had learned to hurdle a small barrier upon hearing an alarm. Now researchers sent a pulse of blue laser light deep into the animals’ ears. They jumped. 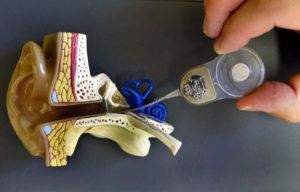 The experiment was part of a study published Wednesday seeking to improve upon cochlear implants — electronic devices that stimulate auditory neurons to partially restore hearing. Instead of using electrical currents, scientists are trying to determine whether optogenetics, a new field that uses light to control living cells, could one day help improve someone’s sense of hearing. Although it could take decades to use optogenetics-based technologies in humans, researchers are beginning to demonstrate that light, not electricity, may be the best way to convey the rich information contained in sound. At the most basic level, the act of hearing is transforming sound into electrochemical signals, the language of neurons, that the brain can then interpret. Much of this process occurs in the cochlea, a snail-shaped organ within the inner ear lined with specialized sensory cells called hair cells. When hair cells detect vibration through thin protrusions on their surface, they generate electrical current in neighboring nerve cells that travel to the brain. In people who have dysfunctional or dead hair cells, cochlear implants work by electrically stimulating auditory nerve cells directly. According to Dan Polley, an associate professor at Harvard Medical School and director of the Lauer Tinnitus Research Center who was not involved in the study, the successes and limitations of the cochlear implant are determined by the anatomy of the inner ear. Within the cochlea, hair cells rest on an organic platform known as the basilar membrane that is floppy and wide on one end and narrow and taut on the other. This biomechanical organization causes hair cells to wiggle in response to specific sound frequencies or pitches that are mapped out smoothly from low to high, like keys on a piano. With cochlear implants, however, electrical current spreads itself over a large area and activates not only the targeted nerves but also neighboring cells as well. This impercision distorts and muffles sound. Moser and other scientists believe that using light, which can be more finely targeted, will improve the performance of implants. To test how quickly neurons equipped with CatCh could process information, researchers exposed neurons to rapid bursts of laser light, up to 300 flashes per second. They observed that individual neurons and groups of neurons were able to keep pace with the flashes by releasing their own corresponding surges of electrical energy. Aside from faster processing, the neurons also showed a graded response to different intensities of light. This suggests that the gerbils could experience an accurate representation of loudness that is proportional to how strongly neurons are activated by light. But how could researchers be sure that all this promising electrical activity was actually creating a sense of hearing in gerbils? Scientists first surgically implanted a loop of optical fibers — a primitive prototype of high-tech cochlear implants that could one day be used in humans — into the gerbils’ inner ear. They then trained the animals to jump over a fence-like obstacle dividing two halves of a box. Once the gerbils learned this behavior, scientists deafened the animals, causing them to become unresponsive to the loudspeaker. However, when researchers pulsed blue laser light through the optic fiber, the gerbils leapt into the air again. Despite these dramatic results, Moser is quick to point out that light-based cochlear implants are not ready for human use. The most obvious hurdle is that installing light-sensitive proteins into cells requires genetic engineering. In the case of gerbils, scientists accomplished the feat by injecting viruses carrying specially designed DNA into the animals’ ears. While gene therapy is being used to treat certain diseases in clinical trials — and has been approved for a rare form of blindness — it remains a long way from reality for most conditions. Another source of optimism is the power of the brain to adapt to new signaling inputs. This article is reproduced with permission from STAT. It was first published on July 11, 2017. Find the original story here.